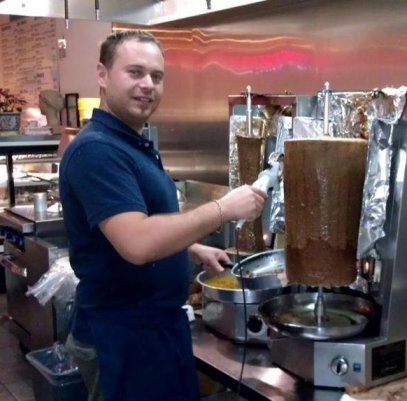 Zorbas Greek Restaurant serves a variety of Greek dishes and of course the famous "Gyro". Come in and taste Greece's most famous food. Come in and taste our special "Zorbas Salad". Juicy Gyro Meat on a bed of crispy lettuce, fresh cucumbers, tomato, onion, Greek Olives, feta cheese, Greek Salad dressing, pita bread, and a side of tzatziki sauce. Konstantinos “Dean” Vasiliou was born and raised in Variko in the Northern part of Greece near Kastoria, population around 800. He was taught how to cook authentic Greek meals at a young age by watching his mother. His family owns a small restaurant coffee shop in Variko. His first time in the Unites States was in 1999. 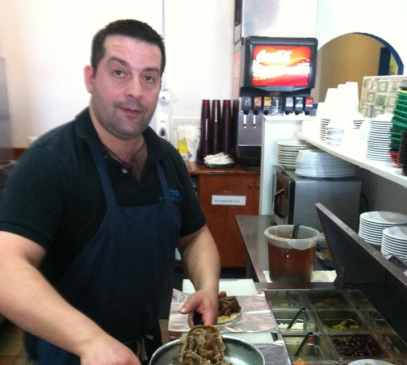 He came back in 2002 to stay, and he started working in the restaurant business for the next six years before opening up Zorbas. Konstantinos "Kosta" Papathanasiou was born and raised in Variko, Florinas also. At the age of 16 he moved away from home to a Greek island and discovered his love for food. Later moving to the Netherlands and continuing his passion for cooking food, he worked and managed a high end Greek restaurant. He has been in the food industry for over 15 years and moved to the United States in 2007. "Go Greek once a week!" Juicy Gyro Meat on a bed of crispy lettuce, fresh cucumbers, tomato, onion, Greek Olives, feta cheese, Greek Salad dressing, pita bread, and a side of tzatziki sauce. (Stuffed Grape Leaves) Three Stuffed Grape Leaves served with Gyro Meat, Small Greek Salad and Pita Bread. Crispy Lettuce, Fresh Cucumbers, peppers, tomato, onion, Greek Olives, feta cheese, and Greek Salad dressing. Toasted bun topped with gyro meat, tomato, onion, and a side of tzatziki sauce. Warm Pita Bread with gyro meat, tomato, onion, and a side of tzatziki sauce. Country fried cod served on your choice of a bun or pita bread and topped with tomato, onion, lettuce, and a side of tzatziki sauce.